If you’ve always wanted to cure your own fine cuts of meat or enjoy the fish you’ve caught with delicious smokey flavors, then the Weber Smokey Mountain 18.5 inch or 22.5 inch or 14.5 inch could be the one for you. 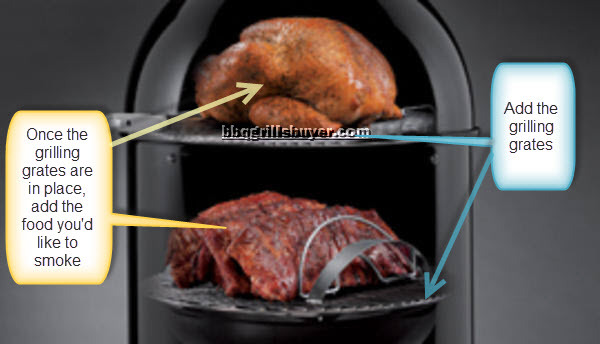 These ingenious and very easy to use smokers from Weber will not only cook your food to perfection but will give it the smokey taste you love. However, there are some differences in each of the models that are worthy of consideration, along with other feedback from owners that you should be aware of. If you have already decided that the Smokey Mountain is for you, scroll down to the bottom of the page for a quick price comparison table. Otherwise, read on to discover all you need to know. Many people today still cobble together their own contraptions for smoking food. Sometimes an old stove or even a refrigerator can be modified to serve as a convenient place to deliver slow heat and smoke to racks of meat and fish – but Weber gives you a better, more convenient way. An extensive review of user satisfaction reports made by those who have actually purchased and used Weber’s Smokey Mountain 18 ½ inch and/or 22 ½ inch Cooker and/or 14.5 inch cooker reveals an almost astounding level of satisfaction with this simple, yet cleverly designed grill. 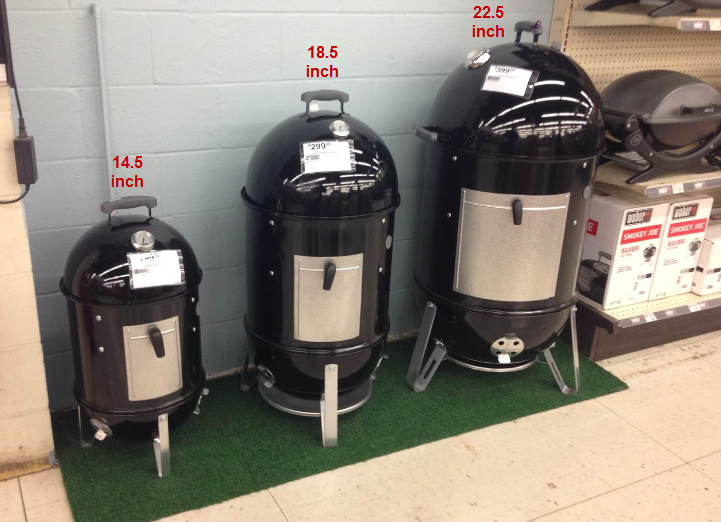 Essentially this Weber smoker comes in the above three sizes. The larger the size, the more food you can smoke at a single time. 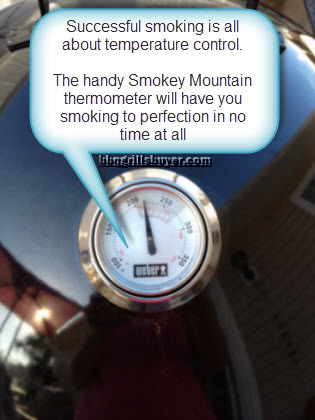 Some claim the Smokey Mountain model gets as good or better results than smokers that cost upwards of $15,000. Others who have never smoked food in their lives report perfect results the first time using their Weber smoker. Many say it is superior and easier to use than supposedly simpler smokers powered by electricity. 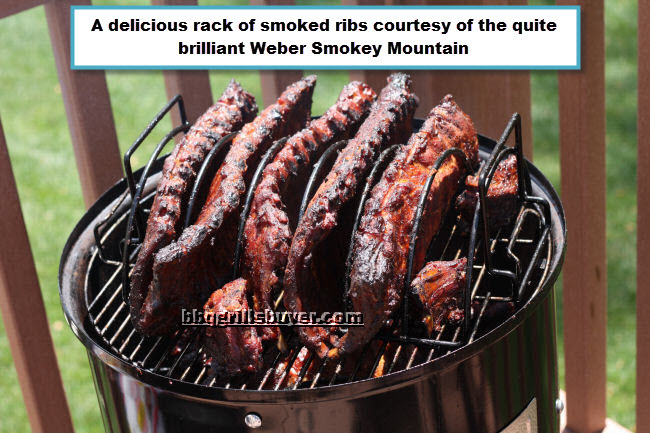 Several credit the Weber Smokey Mountain Cooker with helping them land First place Prizes in cook-off contests. Made for a lifetime of curing and smoking – it’s all in the design. 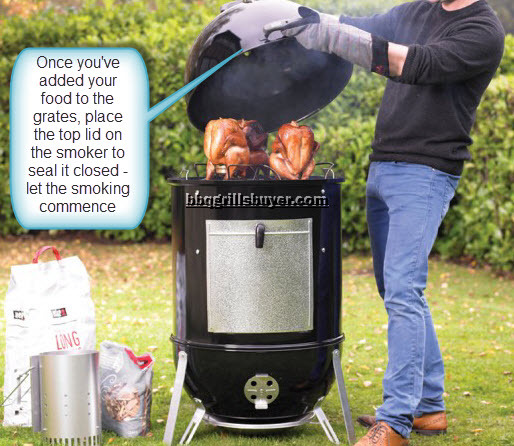 We introduce the 18.5 inch smoker….. The Smoker is made of high-grade steel overlaid with porcelain-enamel finish, but why should you care? Quite simply, this ensures you won’t have to worry about rust or burn through wear for many many years to come after your purchase. The porcelain is baked on at a torrid 1,500 degrees Fahrenheit and is built to last a lifetime of grilling. Because this unit will burn for 12 hours per session, Weber has gone the extra mile to make this unit not only able to withstand a hard workout, but year-round weather, be it rain, or cold winter temps. Two nickel-plated 18-1/2-inch-wide cooking grates provide a generous cooking space that’ll keep your food from sticking to the cooking grate down to a minimum. A one-gallon capacity water pan makes it easy to keep meat moist with minimal or no opening of the smoker to monitor moisture levels. Thermometer – this is strategically placed top, front and center for easy temperature control and monitoring. Individual vents on the bowl and lid increase your control over heat and temperature. The handle is constructed of nylon, making it heat resistant and durable to the weather elements. The cover is solid but light enough to easily take on and off without having to fumble over a hot surface. Bullet-shaped or perhaps small barrel shaped, but domed on top and bottom. Weighs a manageable 46.7 pounds (shipping weight 52 pounds). Just over 41 inches tall. (With lid open). 19 inches from right to left. Interior depth is 21 inches. The size easily accommodates just about any size of roasting bird, chicken, turkey, ribs or other cuts of meat. Also easily accommodates roasts, an entire ham and more. Easy Assembly and set up – only 3 basic sections! 3. The charcoal bowl at the bottom. The lid has a nylon handle and one vent damper. Older models featured a wooden handle, which has been discontinued in favor of the more durable nylon. The middle section has an aluminum access door with a heat-resistant knob. This is where you put in your cooking fuel and water. Note that the access door has a textured finish. Some have a pebbled finish while others have a diamond pattern. You won’t know which finish your access door will have until your unit arrives at your home! It’s a minor mystery we won’t discuss further here, other than to say neither finish is superior or inferior to the other. The charcoal bowl stands up on three aluminum legs, and three vent dampers which are integral to controlling the cooking temperature of the Smokey Mountain. Like the vent damper on the lid, each one has three holes and two “tab” handles for easy rotating. Also, there is a small stopper tab extending down from the rotating vent – this prevents the vent from rotating 360 degrees. Weber’s attention to the small details like these a huge amount of effort on their part to make this smoker a high quality product. (Interesting side note: You may notice two small letters stamped into the metal of the vent damper. These are codes which represent the year your smoker was manufactured. For example, some have “EE” or “HK”. You can look up what these codes mean on the Weber Grill web site). 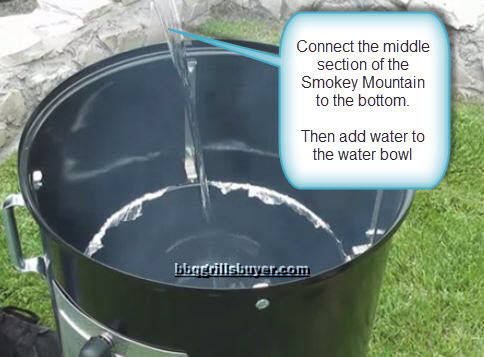 Setting up your smoky mountain ready for cooking is a snap and comes with comprehensive and easy to understand instructions. 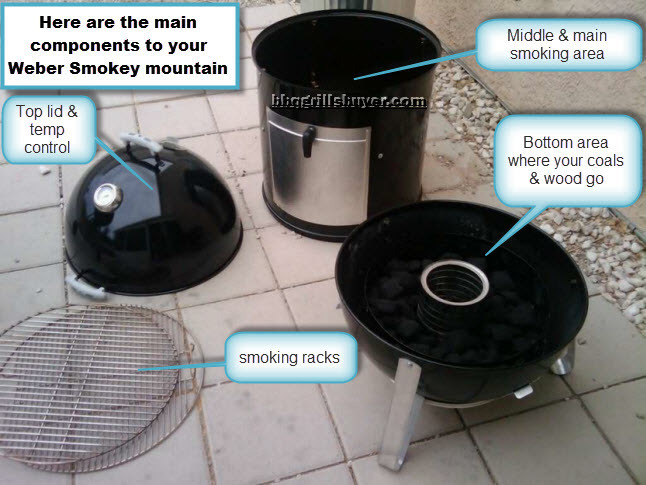 Even the mechanically challenged will find it a breeze and easy to assemble the basic sections and parts of the Weber Smokey Mountain. Starting with the bottom piece, the charcoal bowl: A metal grating fits on the bottom, and on top of that you place the metal charcoal ring, or charcoal “chamber.” This ring is vented with holes and allows for high stacking of fuel that will remain centered on the grate below. KEY FACT: When fully loaded, the Smoker will burn for a little more than 12 hours with no need to add more fuel. In the center piece there are three primary pieces: The water bowl, a cooking grate that sits just above the water pan and another cooking grate a bit higher up above the water pan and bottom cooking grate. All three of these are super easy to insert. Four, three-level straps on the side of the smoker makes it impossible for you to screw up properly placing what goes where. The top cooking grate is 17.5 inches in diameter; the one below it is 17 inches. By the way, these cooking grates are triple-nickel plated. The water pan has a one gallon capacity. KEY FACT: Food can be placed on both bottom and top cooking grates, or just one. Charcoal is loaded in the fuel chamber. The pan is filled with water. Light the charcoal. When they get started, you place the meat on the cooking grates – and then all you need to do is monitor the temperature. Temperature is controlled by opening and closing vents – again, very simple. 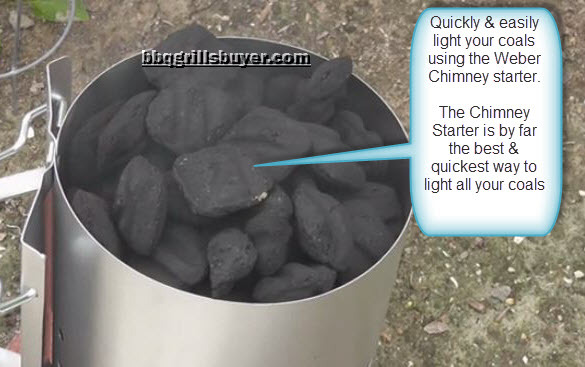 KEY FACT: Charcoal amounts will vary, depending on what you are cooking. 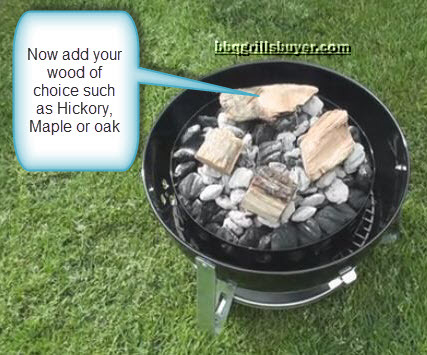 As a general rule, the recommended load for the 18.5 inch model is between 50 and 150 charcoal briquettes. You will also be adding a wood variety of choice to affect flavor, such as apple wood, hickory, maple, cherry wood, and others. Mastering temperature control is the true secret to getting the best results. To this end, most users report that once the Smokey Mountain is set up and burning, the temperature “locks in” to a very narrow range and practically stays there with very little need for further adjustment. KEY NOTE: The temperature gauge is positioned on the top of the Smokey Mountain, so reading and monitoring the temperature is easy and convenient. KEY FACT: It is important to resist opening the lid once the cooker is set up. Each lid removal adds 15 to 20 minutes to the cooking time! Again, just about all users report very reliable temperature control, and with little variation. One user, for example, says he likes to load up his smoker at 9 o’clock in the evening and get back to it at 9 o’clock the next morning after a good night’s sleep. The result: “Perfectly smoked meat in the morning!” (This would also suggest the Smoker is also highly safe and stable, although it is not recommended that the Smoker not be operated when it can’t be monitored on a regular basis). If you prefer to monitor your temperature, from the comfort of your armchair, then a remote thermometer is a good investment – never miss those important moments in the game on TV!! As you might guess, the primary difference between the Smokey 14.5, 18.5 and 22.5 is just that – a larger capacity for the latter. All of the design parameters, including design, look, usability and materials are the same. KEY FACT: You may not think four extra inches of dimension isn’t much, but the reality is this that the 22.5 inch has 75% more cooking space and 50% more cooking surface than the 18.5-inch model. For example, users report that they can easily fit “three tri-tips and three whole chickens” into the 22.5 inch and “still had room left over.” This is obviously an advantage when you have a large party planned with numerous guests. The 22.5 inch model is also considerably heavier, weighing in at 68 pounds assembled, with a 76-pound shipping weight. So it’s roughly 20 pounds heavier. Some have actually complained that the 22.5 inch model is too big. If you have limited space for this kind of unit, you may want to consider the smaller 18.5-inch smoker. On the other hand, if you want to “feed an army” then the larger model is for you. Since my kids moved out and I was looking for a new smoker the wife said KEEP IT SMALL! I showed her the Weber Smokey Mountain 14.5 inch at a home show and she asked me if this was a demo model (Miniature of the real model) LOL! She fell in love with it! I can still fix two racks of spare ribs rolled on their side’s or two ten poundBoston butts if needed but its just the right size for a couple by themselves! One thing about the quality of this smoker is when you close all vents the Charcoal extinguishes itself! It’s a true MIZER on charcoal but if you want to smoke at 250 open it up and on a fill its good for about 8 hours! The quality of food that comes from this thing is absolutely fantastic!…Fit and finish of joints is perfection and the thermometer is dead on! It has a silicone gasket to run a remote thermometer lead through and it’s pretty much fire it up and walk away after you get used to it a couple of times! The thing is built like a tank! Best smoker I could ever imagine owning! KEY FACT: All three Smokey Mountain models, 14.5 inch, 18.5-inch and 22.5-inch, come with a 10-year limited warranty! Light your charcoal. The Weber Rapidfire Chimney starter provides a very quick and convenient way to get started, usually for under $20! Check out the incredible reviews this starter gets – it really is highly recommended. 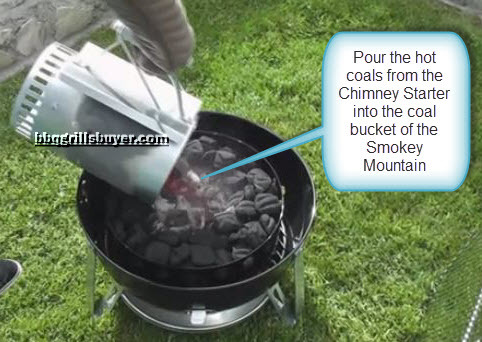 When your hot coals are ready, pour them into the Smokey Mountain bucket. Next add your smoke flavors. What’s your favorite – apple, cherry, chipotle? Now stack the middle section of the smoker, along with the water bowl. Add your water. Add your food to the mid grate, top grate, or both. Add the lid to complete the mountain, and let the smoking commence. The vast majority of customer complaints associated with these products are centered around receiving the smoker with a part missing or nuts or bolts missing. However, Weber does offer a 24-hour hotline for service, and this company has among the best records for its customer service. If it happens you are missing parts, the worst that can happen is that you’ll have to wait a few extra days while Weber ships you what you need. Some have also complained that the thermometer can be inaccurate on some of the units. This may or may not be an accurate complaint because a number of variables can affect the interior temperature of the unit, including the outdoor temperature. An objective review of more than 200 reviews, however, shows very few reports of problems with the thermometer. 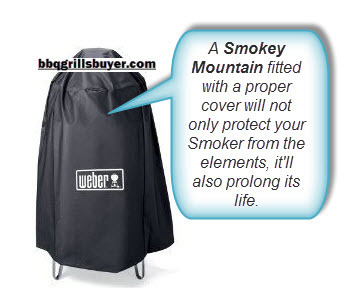 The cover for the Weber Smokey Mountain………. The Smokey Mountain is extremely well built and can quite easily withstand the elements when left outside. 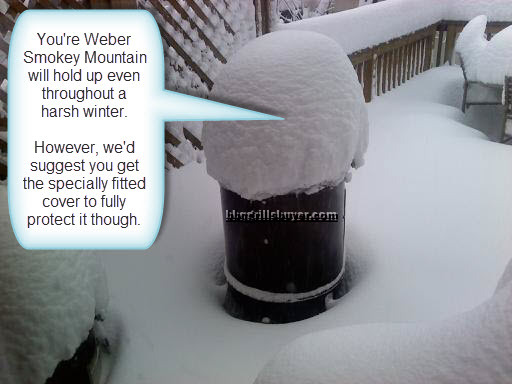 However, we’d suggest always using the Weber fitted cover to help protect it even more and prolong its useful life. The Weber Smokey Mountain Cooker reminds us of what Albert Einstein once said: “The best theories are simple – but not too simple.”… and this sentiment certainly applies to this smoker. The best products are simply designed and easy to use. The Smokey Mountain scores well in this regard. For those who still want to enjoy the pleasure of learning a new cooking technique, and mastering the art of smoke curing fine cuts of meat, the Weber Smokey Mountain Cooker enables anyone with little or no cooking skills to attain world-class smoked food. Imagine how impressed your friends and family will be when you serve them your deliciously smokey fare. Happy owners report they have become a more adventurous cook , saying that going the extra mile to create delicious and succulent smoked food can make you the talk of a cook-off contest, or a barbeque host that is so appreciated, they are talked about for weeks after the event. 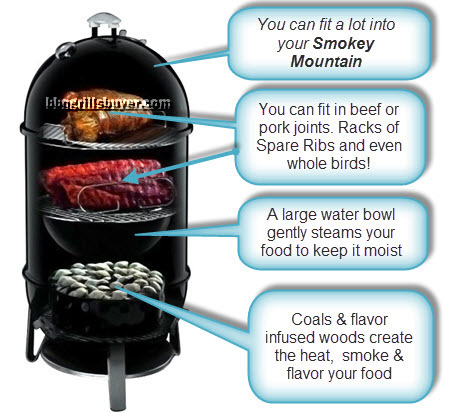 Did our review help you decide that a smokey mountain is for you? If it did, it would help us out if you could click the Facebook Like or G+ button below. Thanks!